Notes: Turner D11. Butler Vol. 2. Map 40.14 (diagram Vol. 5. p.181). Grinsell BELSTONE 2. 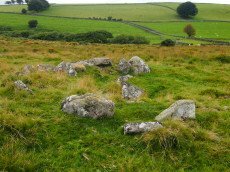 "A Bronze Age ring cairn situated below Belstone Tor within the valley of the East Okement River. The cairn survives as a 0.5 metre high bank surrounding a 4.1 metre diameter internal area. 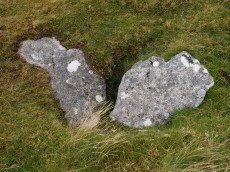 The bank around the southern and eastern side of the cairn is faced on both sides with edge set stones. A large flat stone lying on the south western part of the ring bank may represent a displaced cist coverstone. The overall dimensions of the cairn are 9.5 metres east to west by 8.5 metres north to south." Notes: "A Bronze Age round cairn situated on the summit of Watchet Hill. 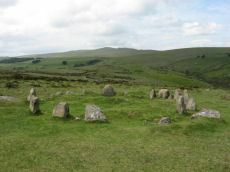 The cairn survives as a 0.8 metre high oval mound measuring 16.6 metres long north to south by 13.8 metres wide east to west. A T-shaped trench, the consequence of a partial early excavation, cuts through the central part of the mound. Adjacent to the south eastern side of the mound there is a 2.3 metre wide and 0.2 metre deep ditch. This represents the remains of the quarry ditch from which material was derived during the construction of the cairn. The ditch would have originally surrounded the mound but now survives largely as a buried feature." Notes: [Formerly listed as Higher Tor (S), renamed after PMD] Butler Higher Tor (S) Vol. 2. Map 40.15. (diagram Vol. 5. p.169). Grinsell LYDFORD 1 (SE of Winter Tor).